He was a middle-aged living legend with three failed marriages behind him. She was the barely-legal daughter of a world famous playwright. No-one thought it would last, but they had one of the most enduring relationships of any couple subjected to the scrutiny of the public eye. Oona O’Neill’s parents divorced when she was two years old, and her famous father made only occasional appearances in her life. 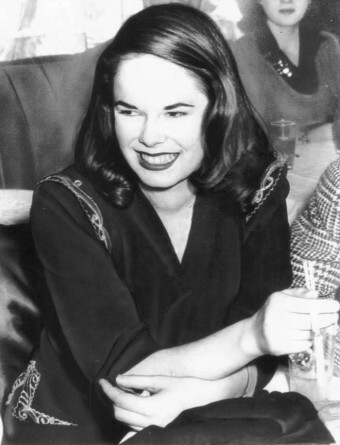 She attended the exclusive all-girls Manhattan boarding school Brearley, where she palled around with fellow socialite Gloria Vanderbilt and dated Orson Welles and J.D. Salinger. Shortly after graduation, Oona headed west to Hollywood to try her hand at acting. She met Chaplin at the home of her agent, who was recommending her for a part in one of Charlie’s films. She did far better than that. On June 16, 1943, Charlie Chaplin, world renowned actor and director, married Oona O’Neill, recent high school graduate and daughter of Pulitzer Prize winner Eugene O’Neill. Chaplin was 54, O’Neill was 18. Not everyone was as thrilled as the happy couple. Eugene O’Neill, the same age as his new son-in-law, was so incensed that he disinherited Oona upon hearing of their elopement. Many others cynically questioned their motives for marrying and waited for Chaplin’s fourth marriage, his third to a bride under the age of 19, to implode. But it didn’t. The Chaplins remained unquestionably devoted to one another until Charlie’s death in 1977. When Chaplin’s US visa was revoked in 1952 during the Red Scare due to his leftist views (see: Charlie Chaplin vs. The United States), Oona renounced her American citizenship and became an English subject. The Chaplins acquired an 18th century villa on Lake Geneva in Switzerland where the couple maintained a low-key lifestyle raising their eight children. They entertained many fascinating personages at their home including Nikita Khrushchev, Pablo Casals and Jawaharlal Nehru, with Charlie acting as the jovial host, and Oona as the gracious but more subdued hostess. The Chaplins only returned to the United States on one occasion. Charlie went to the Academy Awards to accept an honorary Oscar in 1971. A film retrospective of Chaplin’s extraordinary career was shown, and the lights went up revealing Charlie already standing on the stage. The audience gave a ten minute standing ovation, the longest in Oscar history. Chaplin was obviously moved, and he gave an emotional speech. Charlie Chaplin died at the age of 88 on December 25, 1977 at the couple’s home in Switzerland. Oona became a recluse and seemingly never truly recovered from the loss of her husband. She died of pancreatic cancer on September 27, 1991 at the age of 66.